"add-apt-repository" is an Ubuntu-specific script to add or remove repositories which, among others, automatically imports the public GPG key. For more information, see its man page. You can use "add-apt-repository" in Debian to add Launchpad PPAs however, there are a few things that you should know. Read on to find out how to use "add-apt-repository" in Debian. Important: many Launchpad PPAs are not compatible with Debian, because the packages are built against specific Ubuntu libraries. Some Launchpad PPAs work in Debian though - for example, the WebUpd8 Java and Atom PPAs. So make sure you know what you're doing before adding a Launchpad PPA in Debian! Then you'll be able to use "add-apt-repository" in Debian. However, "add-apt-repository" doesn't work exactly the same in Debian as it works in Ubuntu, so here's what you need to do to use it properly in Debian. A. Adding Launchpad PPAs in Debian as "add-apt-repository ppa:some/ppa"
it only works with Launchpad PPAs. However, if you add a PPA under this form (for example: "add-apt-repository ppa:webupd8team/java), the PPA source file will use your current Debian version (for example, "wheezy") and it won't work, because you need to use an Ubuntu version here. To get it to work properly, after using the "add-apt-repository ppa:some/ppa" command, you need to edit the PPA source file which is located under the /etc/apt/sources.list.d/ folder, and replace your Debian version (for instance "wheezy") with an Ubuntu version - I recommend using a LTS version such as "trusty" or "precise" because non-LTS Ubuntu version are only supported for 9 months. Another way of using "add-apt-repository" to add a PPA in Debian (it's the same in Ubuntu) is to use the full source entry. this can be used for any repository, not just Launchpad PPAs. 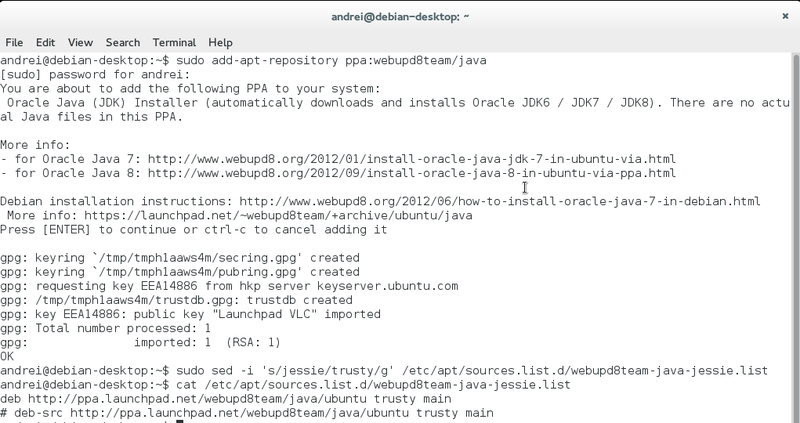 sudo add-apt-repository "deb http://ppa.launchpad.net/webupd8team/java/ubuntu trusty main"